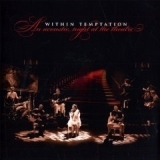 WITHIN TEMPTATION - AN ACOUSTIC NIGHT AT THE THEATRE LTD. EDIT. (2CD) | Online Shop | Wizard LTD. Album: "AN ACOUSTIC NIGHT AT THE THEATRE LTD. EDIT. (2CD)"
The glorious symphonic rock of Within Temptation , crowned by the voice of stunning singer Sharon den Adel, has brought this remarkable band a decade-long international career and seen them become one of the most popular bands of their genre, selling over 100,000 units in the UK alone. 'An Acoustic Night At The Theatre', will show an entirely different but still captivating side of the band: one that can be simplified and stripped down.In November 2008, Within Temptation branched out and embarked on a sold-out intimate theatre tour with seated audiences. This gave them the opportunity to rearrange several classics from their extensive catalogue to particularly suit an acoustic performance. The recording on this album is from the show at the Muziekcentrum Frits Philips in Eindhoven, Holland on November 30. The acoustic arrangements on the album let you hear different influences in the music - some Celtic elements which come out best when played acoustically. Keith Caputo (Life Of Agony) joins in on 'What Have You Done' and The Gathering’s Anneke van Giersbergen makes a powerful duo with Sharon on 'Somewhere'. Of additional note, the album also contains the brand new song Utopia, written during the rehearsals for the theatre tour. A duet with UK singer-songwriter Chris Jones (who Sharon met while working with world-famous DJ Armin van Buuren on his track In And Out Of Love). ‘An Acoustic Night At The Theatre’ is a unique opportunity for fans to hear the band’s beauty stripped bare.